Venezuela is at the forefront of revolutionary movements in the Americas. This webinar comes one year after the passing of revolutionary leader and former President Hugo Chávez. 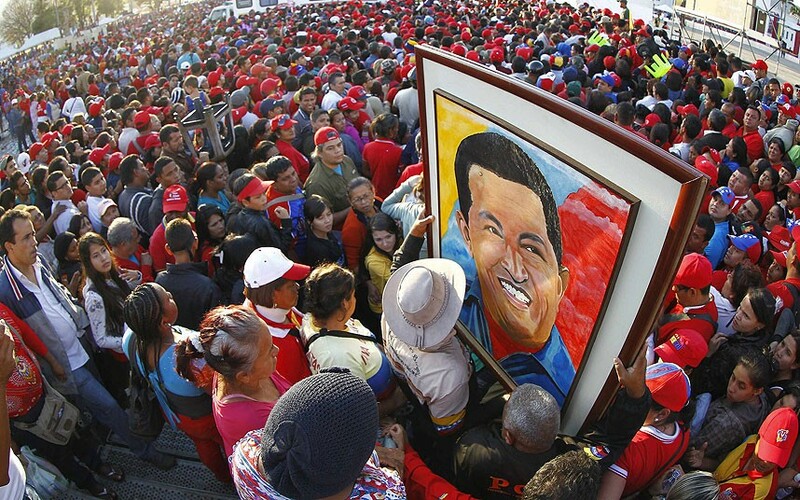 More than ever the Venezuelan people and countries across the Americas continue to support the Bolivarian and socialist project that he and the people championed. And more recently, this informative webinar comes as an act of resistance and solidarity following the right wing opposition´s violent attempts to overthrow the democratically elected Venezuelan government of Nicolás Maduro and garner international support for foreign, namely US, intervention. This webinar will be an on the ground live report by Caracas based Jeanette Charles, board member of Witness for Peace Southwest and newly appointed correspondent for Telesur-English. Information will be provided on how to join a WFPSW fact finding delegation to Venezuela in May and July of this year. Also we will discuss what we can do here at home in the U.S to stand in solidarity with the Bolivarian process and prevent US interference and US Media misrepresentation of the Venezuelan democratic process. Presenter: Jeanette Charles is a grassroots educator, writer and youth organizer from Los Angeles, California. Member of the Chiapas Support Committee and board member for Witness for Peace Southwest. Jeanette has spent considerable time in and across the continental Americas with Afro and indigenous communities as well as popular media collectives. Jeanette is currently located in Caracas, Venezuela and recently became a correspondent for Telesur-English. Jeanette will lead the May WFPSW delegation to Venezuela. Facilitator- Tanya Cole is Director of Witness for Peace Southwest based in the states of California, Arizona and New Mexico. WFPSW will be hosting 2 upcoming delegations to Venezuela in May and July. For more information contact southwestwfp@gmail.com or call 805-669-VIVA. Below are the conference details. The conference has audio and visual options available. All participants will be muted except for the organizers. To un-mute yourself in order to comment or ask a question press *6 on your phone. You will enter a website where the organizers will be guiding you through photos and written reports while you listen on the phone conference audio line. You can ask questions via chat and use the “Raise Your Hand” feature to let organizers know you have a question or comment. A packet of materials with background articles on Venezuela is available. Thank you for joining us!